For the past couple of years, Kelly and Lindsey Meyer have been pumping out some interesting beers, primarily wheat beers with a few sours thrown in from time to time. Lately though, it seems that sour beers seem to be the focus from the brewery. They are even making some changes, and improvements in the barrel program. Last year, NBBCo released Les Fleurs Du Mal, or the Flowers of Evil, a beer that started off as a Hefeweizen, then put through open fermentation, and aged 4 months with lemon grass, then bottle-conditioned with TX wildflower honey. When Kelly fir st told me about this beer, I was intrigued by the name, and of course the label which features a pile of skulls with hand drawn flowers by, I believe, the Meyer’s daughter. The beer name is written in a grungy, splattered style font, which adds to the mystique of the label. By far, this is the best label by NBBCo, Sans cesse à mes côtés s’agite le Démon also appears on the label which translates to The Demon is always moving about at my side. 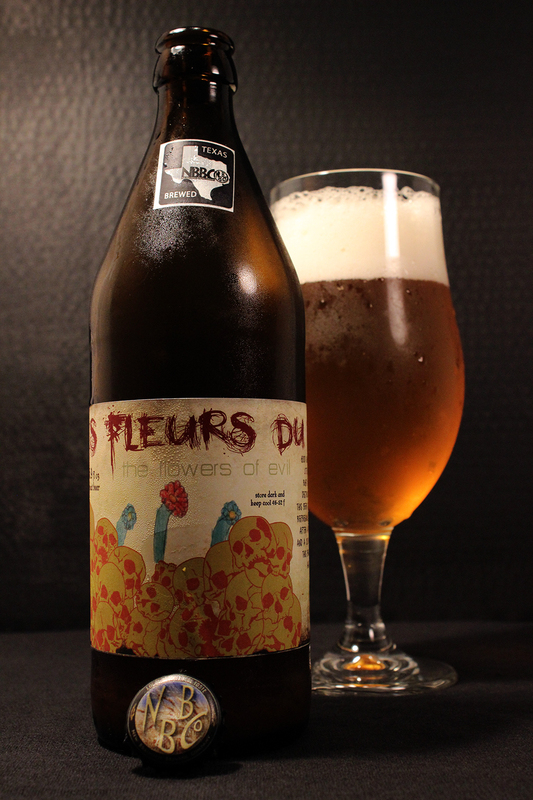 I poured Les Fleurs Du Mal into a tulip style glass, a recommended glass type for this style of beer. The beer’s appearance was a hazy bright yellow straw color. On the pour, there was a large white foamy head that was over an inch thick. It stuck around a while, leaving excellent spotty lacing down the glass. The Nose was full of characters. Right away there was some sour funkiness, followed by lemon grass, stone fruits like apricot, small hint of banana, hay and wheat. There is a good backing of wheat bread, and earthiness. The taste is also full of the same characters as the nose. Big sour funk hits the palate first, then the barnyard funk, wet hay, wheat, biscuit bread backbone. Good fruit notes cut through, apricot, a little mango, light ripe banana, and lemon grass. The sourness with a little earthiness, and the fruit flavors shine through in the aftertaste. The body of this beer is a solid medium thickness, with a mouth puckering acidic tartness, but a smooth mouthfeel. The finish is dry, which works perfectly with the flavors that linger in the aftertaste. Overall, I was impressed by this beer. To me, this beer delivers on it’s promises. This beer has the qualities of a Hefeweizen, and it is sour. I read a lot of negative things online about this beer, but I do not see the bad hype around this one. For me, it has been one of my favorite beers produced by New Braunfels Brewing Company. I like the new direction they are heading with their experimental sour barrel program. I really hope to see some good stuff from them. I know I will. Cheers Kelly for The Flowers of Evil!